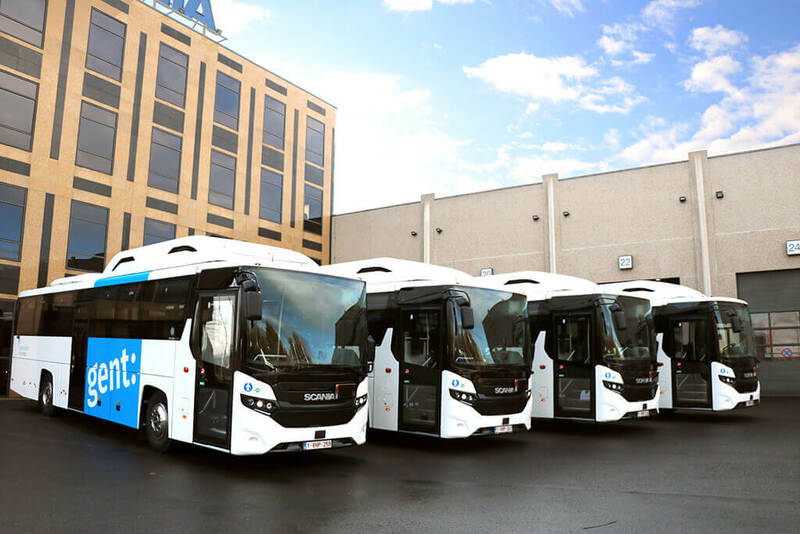 Four gas-powered Scania Interlink LD school buses have recently been delivered to the Belgian city of Ghent. They are replacements for four older diesel buses and the city now aims to change all nine school buses in its fleet to more sustainable alternatives. Ghent is a city in transition with the ambitious objective to reduce carbon emissions from transport by 40% (compared to 2007) by 2030. In addition to the four new buses, the city has ordered 11 gas-powered Scania trucks for delivery this spring. Ghent ordered its first gas-powered truck in 2016, a Scania P 340 with a crane and container. The city’s sustainable mobility plan, launched in 2016, is already bearing fruit with registered nitrogen dioxide levels in the centre declining by 20%. The 12m Scania Interlink Low Decker offers 51 seats with safety belts and additional room for standing passengers. The Ghent school buses are equipped with blind spot cameras as well as side-view and rear cameras. The driver is made aware of nearby pedestrians and cyclists through audible alerts and displays on the instrument panel and on both A-pillars.